WE TAKE A BREATH AND GO ON! All teachers were relieved by the political change in January 2015. Iron fences and riot police were removed from the centre of Athens, the House of Parliament and the Ministries’ buildings restoring thus the spirit of democracy that should be emitted from a European capital city. We all felt – despite what each voted – that we are at last taking a breath. We are taking a breath of democracy feeling that several things in our country – and particularly in Education – can be changed. In the last five years, the memorandum policies of austerity and cuts have brought the public schools and the teachers in a tragic situation. And the same has happened for all social goods including health, social insurance and social welfare. These five years were marked by cuts in public spending, suspensions – layoffs of public servants, closing of schools, authoritarianism in evaluation and disciplinary law, as well as by anti-educational changes. In our country the implementation of memorandums was nothing more than a laboratory producing extreme, neoliberal policy. The social consequences of this policy are dramatic for working people; but they are even more dramatic for the most vulnerable group of citizens, the young people. Young people unemployment mounts to 60% currently, the percentage of NEET (no education, no employment, no training) in young people reached 21% in 2012, while the poverty index and social exclusion for young people under 18 reached 35,4% in the same year. The recent announcements in the Parliament by the new political leadership of the Ministry of Education include: a) reduction of the examination load, abolition of the existing test bank and change of the current examination system, b) restoring the abolished sectors in the Vocational High Schools (EPAL) and reinstating suspended teachers in their former teaching positions c) freezing of the evaluation process d) abolition of admission examinations in Experimental and Model Schools e) promise of real, meaningful consultations about future educational changes. All the above are clearly in a positive direction and their implementation creates expectations for a brighter future in public schools. It is clear, however, that to reverse the situation within the public educational system in a way that the needs of young people and of society at large are met, strong efforts, sufficient funding, proper training and a sound educational plan are required. 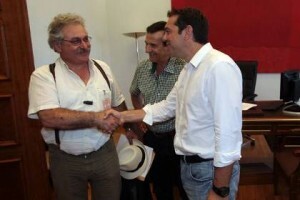 To claim an increase in public spending for education, even during the crisis. Investing in education is the most certain way to exit the crisis. It is an investment in a better future. To fight for the improvement of working conditions and teacher salaries, as well as of the scientific and social structures that support their work. Finally we must fight, in collaboration with our colleagues in all European countries, to stop neoliberal policies all over Europe which affect public education among other social sectors. For a Free, Public Education for All, without Discriminations. Since early September 2013 an important battle has been waged in Greek Universities against the mass lay-offs of administrative personnel. As part of the draconian austerity terms of the bail-out agreements with the “Troika” (EU-IMF-ECB), the Greek Government has been forced to reduce the number of public sector employees. Part of this reduction process are the so-called ”suspension –mobility” schemes”, according to which civil servants and public sector employees are suspended (receiving for some months only 75% of the their basic salary) and then be either moved to another position (“mobility”) or simple laid-off. The continuation of the loan payments by the Troika is dependent upon accomplishing specific numbers of suspensions and lay-offs. Greek Universities have also been included in this process, despite being notoriously under-stuffed. More than 1,300 University employees (administrative personnel, guards, etc.) are going to be suspended, with more than half of them facing eventual lay-off. Greece’s two oldest Universities, the University of Athens and the National Technical University have received the heaviest blow. 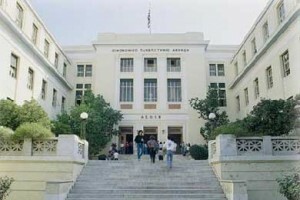 To give an example: the University of Athens will lose 498 of its 1,337 employees in technical and administrative positions. Whole departments such as the Physics Department, the Chemistry Department, the Informatics and Communication Department will be left with no administrative personnel at all. These suspensions and lay-offs will totally cripple Universities’ ability to function properly. Departments are going to be left with practically no administrative staff. Libraries will be left without librarians. University campuses will be left without guards for their entrances. Research funding will be lost because of the absence of staff to handle applications. This lay-offs came after three years of reduced budgets (some universities find it difficult to pay their electricity bills), slashing of funding for adjunct faculty members, prolonged delays (more than 3 years in average) in appointing elected faculty members, and forced department closures. The current attack follows the introduction of aggressive neoliberal reforms that have drastically reduced student participation and undermined democratic procedure within Greek Universities, in line with the “Bologna Process”. The reaction by the unions of University administrative personnel has to been to call for mass strikes. The University of Athens and the National Technical University have been closed since the beginning of September, and there have been no exams, classes, enrollments. In other universities that have been affected by the suspensions / lay-offs there have been prolonged strikes. The Greek Government has attempted to use students as a means to put pressure on the Unions. However, Student unions have called for mass occupations of University buildings in support of the striking employees and against what is being perceived as the dismantling and potential privatization of Higher Education. University Teachers Unions have also staged prolonged strikes. The Ministry of Education has adopted an extreme authoritarian and disciplinary attitude. It has initiated disciplinary process (with the danger of eventual lay-off) of 278 employees that refused to be part of the selection process for the suspensions invoking their right not to participate in administrative processes when on strike. It has gone to the Courts demanding the strike to be declared illegal. However, the Unions are defying the Court order. It has even announced that it will use riot police units to open Universities. The only allies of the Government have been the student sections of the New Democracy party that has tried – without success – to initiate an “Open Universities” movement and the University Councils, new oligarchic governing bodies introduced as part of the latest wave of neoliberal reforms. The announcement of the preliminary list of employees to be suspended made everyone realize that it would practically impossible for Universities to function properly. The Senates of the University of Athens and the Aristotelian University of Thessalonica have announced their resignations in protest. Students are insisting in their occupations. At this moment (November 2013), we are at a crucial stage of the struggle. It is not only a struggle against lay-offs. It is a struggle to defend Public Higher Education as a social right against privatization and commodification. It is a struggle to defend Higher Education as a democratic social and political space against the neoliberal authoritarianism.